For many people, kitchen is more than a place that is used for cooking and they want to make it look classy all the time. If you are looking for a renovation or building the kitchen from the ground up, the best way to make your kitchen look eye catching, is by the use of Granite. When you install granite countertops, you prepare your home with a sense of style that is really hard to match. Here are some reasons to choose Granite for your kitchen. Granite is ageless. It makes your kitchen look elegant while giving it a touch of class. Once you have granite installed in your kitchen, you kitchen can never be out of style. The surface of the granite is smooth and it has a gorgeous sheen and it has a very long life. Granite can be paired with almost any design theme. As the stone is available in too many design options, you don’t have to work hard to match it with any style or colour theme. There are many choices of granite countertops installation shops in Edmonton, that offers you wide varieties to choose from. You can just select the one that goes well with the decor of your house and will help you to modernize the entire look. You have too many choices in the granite when it comes to the selection. 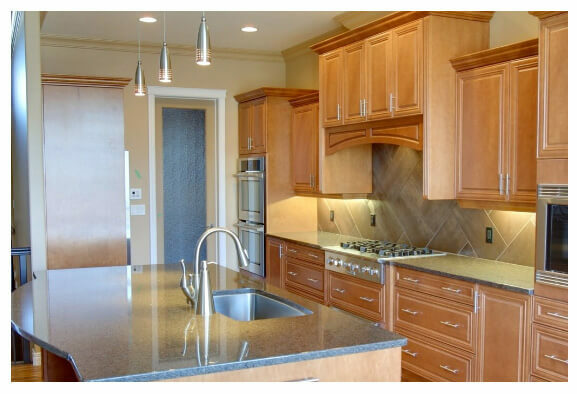 If you want to create a custom look for your kitchen, then the granite is the best choice. You can go for the dark or solid colour slab or you can opt for lighter shades in smaller sizes. Granites can be ordered with different shades of flecks, streaking, veining and they add a depth of style on the overall decor of the place. Edmonton granite countertops have too many choices and they are available for everyone. Granite is lot easy to clean and maintain on day to day basis. You don’t have to use any special detergent or liquid to clean the surface of the granite. A soft damp cloth along with the cleaning liquid that you use in the kitchen is all that you need. You can also use the mix of essential oils and water to maintain the shine on the surface of the granite. When you have a granite countertop at your kitchen, the value of your house can be increased by as much as 25%. According to the real estate market, people prefer homes that have granite countertops and they are ready to pay more for a classy looking kitchen. If you want to maximize the value of your home, you can also use the granite on the countertops other than kitchen. Even if you are not planning to sell your home right now, but for the future, having granite comes handy.